EM Records in Japan has released a CD, “The Best of the Android Sisters.” There’s also a 48 page color booklet with the song lyrics, in both Japanese and English, and filled with illustrations of the Android Sisters (each song is illustrated). Plus there are photos and interviews with everyone involved. It’s awesome. The Sisters are not singing in Japanese, these are the original songs. 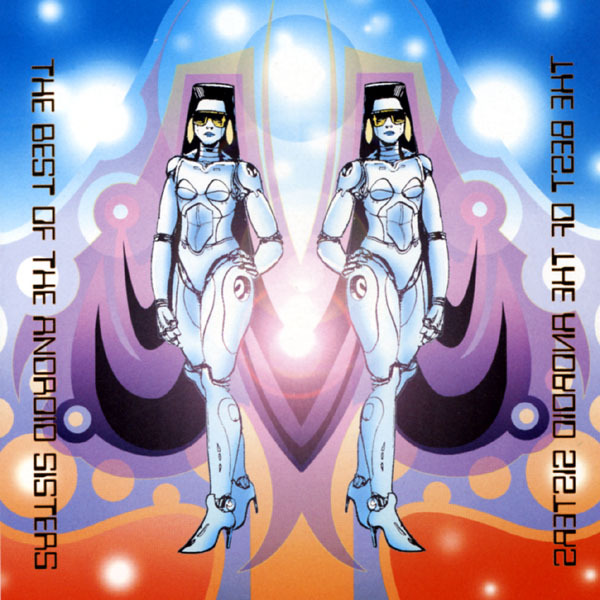 If you own “The Android Sisters Greatest Hits,” then you have most of the songs. But there are a couple that are not on any CD, except for this Japanese release, they are - “Robots Are Coming,” and “Dumb is Fun.” Because they are from Japan, and because EM Records paid plenty to design and print such a fat, lavish booklet, and a CD; they are costing us plenty to import. But boy o boy, is it worth it! Here’s a list of the Sister’s songs on this CD: “Sub Liminal”, “Down on the Electronic Farm”, “Invasion”, “Robots Are Coming”, “Barking Up the Wrong Tree”, “Ray-Dee-Oh”, “Money Money Money”, “Electronic Sheep”, “Huh?”, “Telephone Wires in the Tropics”, “Elephants and Donkeys”, “Coconut Cooed”, “Dumb is Fun”, “Livin’ in the 50’s”, and “Sss-x Minus One”.